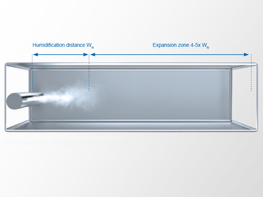 The humidification distance in adiabatic humidification systems is often defined by the overall length of the humidifier based on the design. 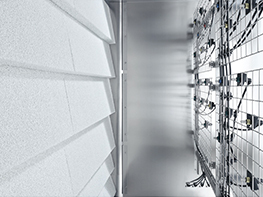 However, if devices that atomize aerosols in the air current are used and these aerosols are incompletely deposited (high-pressure or ultrasonic humidifiers), the humidification distance must also be taken into account here. Regardless of the hygiene issues, the same basic principles, described in chapter 2.1.1 of the planning guideline booklet, apply in this case. 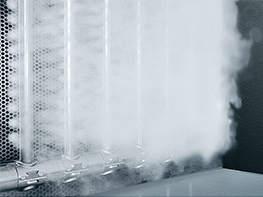 However, due to the low energy content of the atomized water, humidification distances longer than those used in steam humidification are used.